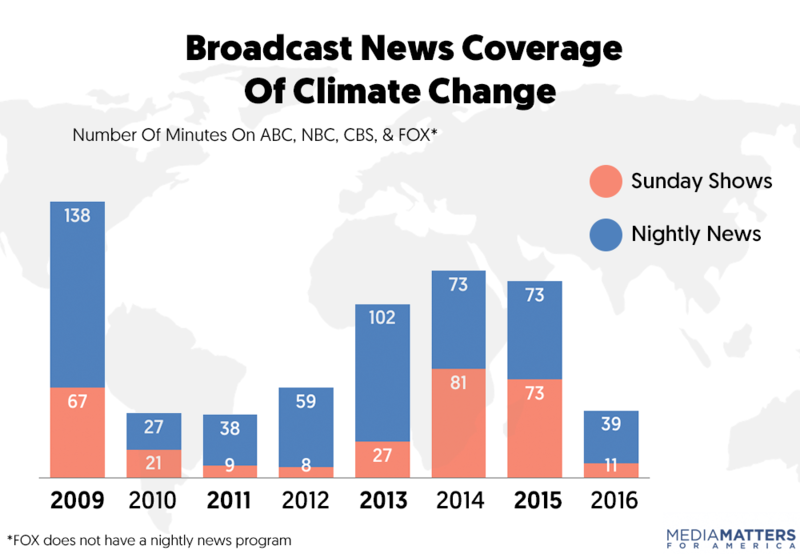 In 2016, evening newscasts and Sunday shows on ABC, CBS, and NBC, as well as Fox News' "Fox News Sunday," collectively decreased their total coverage of climate change by 66 percent compared to 2015, even though there were a host of important climate-related stories, including the announcement of 2015 as the hottest year on record, the signing of the Paris climate agreement, and numerous climate-related extreme weather events. There were also two presidential candidates to cover, and they held diametrically opposed positions on the Clean Power Plan, the Paris climate agreement, and even on whether climate change is a real, human-caused phenomenon. Apart from PBS, the networks also failed to devote significant coverage to climate-related policies, but they still found the time to uncritically air climate denial — the majority of which came from now-President Donald Trump and his team. ***Unlike the nightly news shows on ABC, CBS, and NBC that air for a half hour seven days a week, "PBS NewsHour" airs five days a week and is a half hour longer. In the roughly 45 weeks before the November 8 election, the networks aired a total of 55 segments about climate change — roughly one per week. 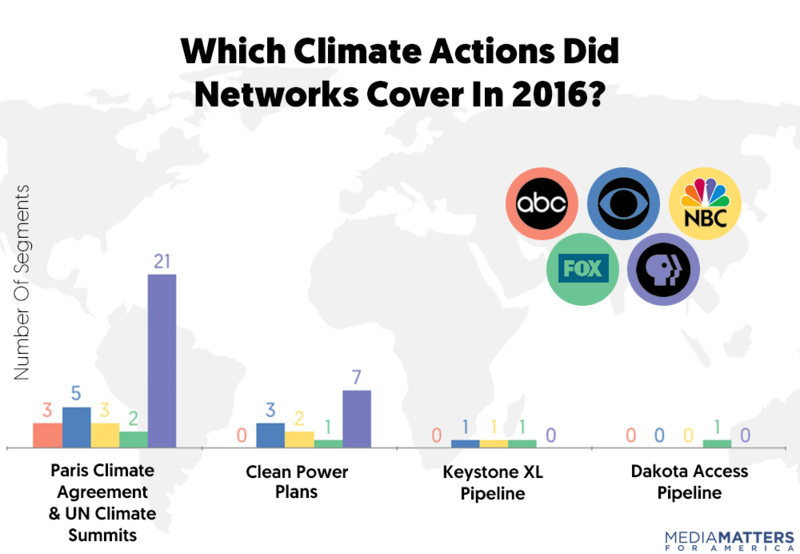 After the election, the networks aired 32 climate-related segments over approximately seven weeks till the end of the year — about five stories per week. In 2016, "CBS Evening News", "PBS NewsHour", and "Fox News Sunday" aired a combined five segments that misled audiences by featuring climate science denial. Half of "Fox News Sunday"’s climate-related segments included climate denial. In every instance, it was Trump or Trump officials promoting denial. Segments on PBS, CBS, and NBC nightly news shows also included climate denial, but reporters noted that that these statements were at odds with established climate science. 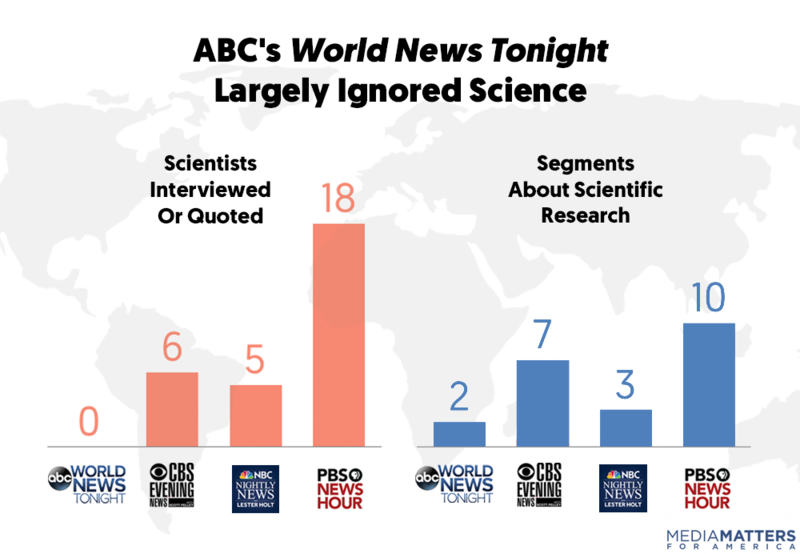 ABC’s "World News Tonight" did not feature a single scientist in its climate coverage for the second year in a row. By contrast, "NBC Nightly News" and "CBS Evening News" featured five and six scientists, respectively, and PBS NewsHour featured 18. After featuring just two scientists over a five-year period from 2009 to 2013, the Sunday shows featured seven scientists in 2014 alone, and then backslid in 2015, quoting or interviewing just two scientists (4 percent of all Sunday show guests). In 2016, that backslide continued, with the Sunday shows featuring no scientists in their climate-related coverage. 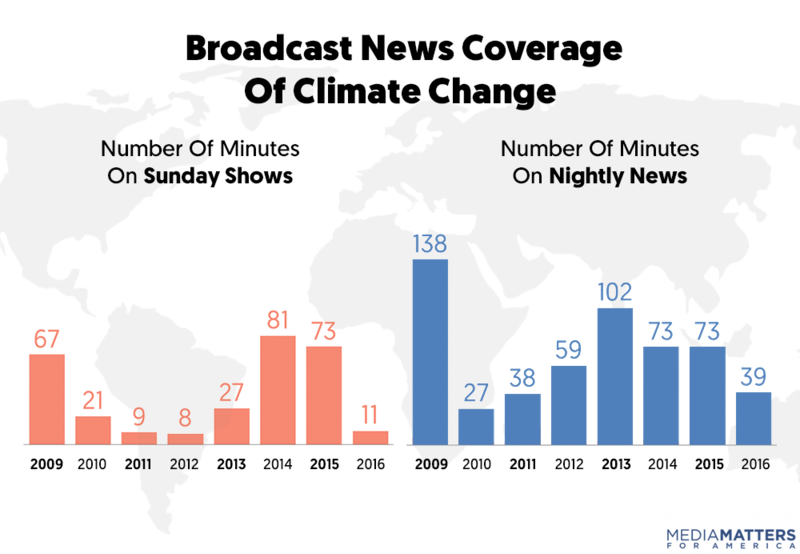 After dropping slightly from a high of 81 minutes of coverage in 2014 to 73 minutes in 2015, the Sunday shows’ climate coverage dropped 85 percent to just 11 minutes of coverage in 2016 — the third-lowest amount in the eight-year time frame Media Matters has examined. Every network saw significant declines in Sunday show coverage, with Fox leading the way (down 32 minutes from the previous year), followed by NBC (down 17 minutes), CBS (down 10 minutes), and ABC (down four minutes). 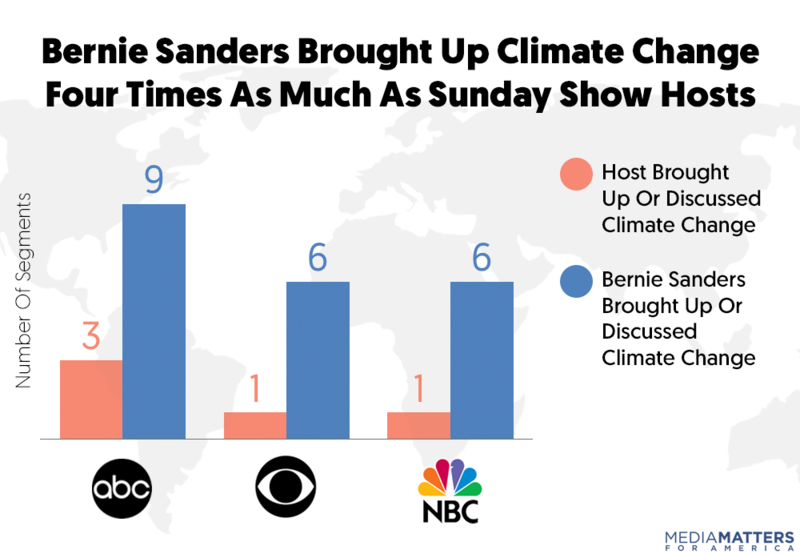 On every Sunday show except "Fox News Sunday", Sen. Bernie Sanders, I-Vt., brought up climate change significantly more often than the hosts themselves did. ABC’s This Week, CBS’ "Face the Nation", and NBC’s "Meet the Press" aired a combined five segments in which the hosts brought up climate change, while Bernie Sanders brought up climate change 21 times during his appearances on those shows. 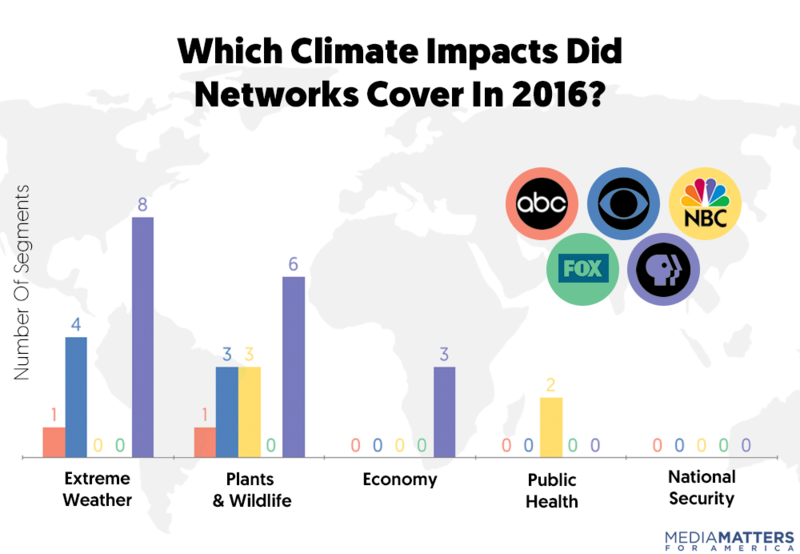 Because our study counted only those segments where a media figure brought up or discussed climate change, those 21 segments were not counted in this study's overall network tallies. 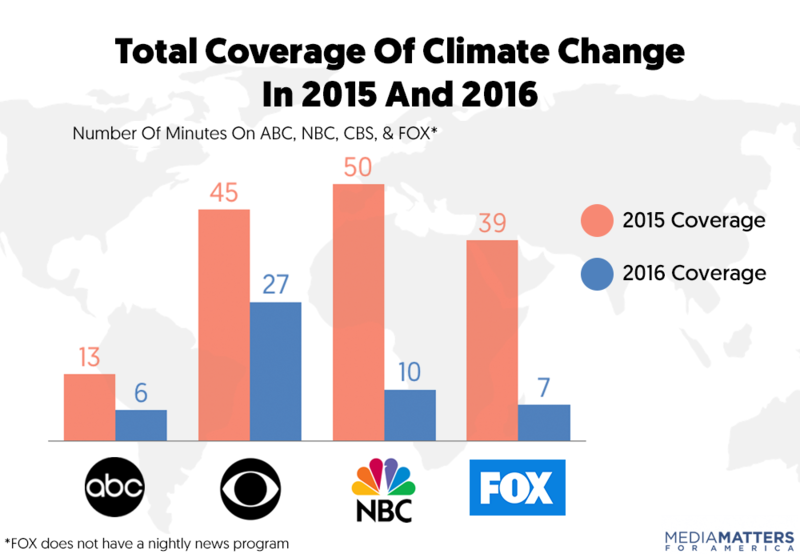 The nightly news shows on ABC, CBS, and NBC collectively decreased their climate coverage from approximately 73 minutes in 2015 to just over 39 minutes in 2016 — a drop of 46 percent. "NBC Nightly News" had the biggest drop in climate coverage, decreasing by about 22 minutes, followed by "CBS Evening News", which had a drop of approximately nine minutes. ABC’s "World News Tonight", which aired significantly less climate coverage than its competitors in 2014 and 2015, once again continued its downward trend, dropping even further from roughly seven minutes of climate coverage in 2015 to just four minutes in 2016. For the second consecutive year, "PBS NewsHour" aired more segments addressing climate change than the other nightly news shows combined. "PBS NewsHour" aired 46 climate-related segments, while ABC (five), CBS (19), and NBC (12) aired a combined 36 climate-related nightly news segments. However, PBS NewsHour’s climate coverage decreased from 2015, when the network aired 58 climate-related segments. In just over two months, "NBC Nightly News" has already aired about five minutes of climate-related coverage, roughly half as much as the show aired for all of 2016.